1966 Foreign-language correspondence for philatelist, Dr. P.Kucharský. Převod basic termínů to 8 world languages. good condition. 1962 Foreign-language correspondence for philatelist, Dr. P.Kucharský. Převod basic termínů to 8 world languages. good condition. 1998 Czechoslovak post. stamps and their/its forgeries, engineer. John Karásek, incl. black print, book with dedication from of author. 1935 Czechoslovak stamps, E. Hirsch - J. Franěk, good condition. 1988 Philatelic manual Federation of Czech Philatelists No.10 - Austria issue 1850, P.Hirš + 2x older notebook catalogue Kolár Austria 1850-1918 and Bosnia, all good condition. 1971 Chemical expertization and cleaning stamps, Ladislav Novotný. 1985 catalogue Australia - Seven Seas Stamps, 19. issue. good condition. 1989 catalogue Australia - Seven Seas Stamps, 20. issue. good condition. 2004 catalogue Austria NETTO spezialkatalog 2004/2005. As new. 1976 catalogue Austrian Post Offices Abroad, Part eight, Austrian LLoyd: Liechtenstein, Cyprus, Egypt, Palestine, Syria, Asia Minor, K.Tranmer. As new. 1981 catalogue Austrian Post Offices Abroad, Part one, Austrian LLoyd: Adriatic Lines, Mediterranen Lines. K.Tranmer. As new. catalogue Gibbons Thematic Catalogue - collet Aircraft on stamps. As new. 1993 catalogue Gibbons Thematic Catalogue - collet Ships on stamps. As new. 1988 catalogue Michel Mittel and North America + South America, Übersee band 1, 2. Used, good condition. 1999 catalogue Michel Briefe (letters) - Deutschland (Germany) 1999/2000. Very in good condition. 1940 catalogue Michel Europe 1940 + catalogue Zumstein Europe 1949. Stopy usage. 1980-85 catalogue Michel Ganzachen - Deutschland (Germany) 1980 + Briefe-Katalog Deutschland (Germany) 1985. Very good condition. 1998 catalogue Pofis Czechoslovak p.stat 1918 - 1992, volume I, new. 1999 Catalogue Pofis Czechoslovakia 1918 - 1939 + catalogue Pofis Czechoslovakia, Czech Republic, MC, BOHEMIA-MORAVIA, Slovak Rep. Very good condition. 2001 catalogue Pofis Czechoslovak p.stat 1918 - 1992, volume II, Un. 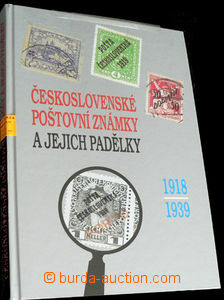 1999 catalogue Pofis Czechoslovakia 1918 - 1939, new. 2004 catalogue Pressfil Czech Republic 1993 - 2004, new. 1997 catalogue Trojan Czechosl. air post 1918 - 1939. As new. Michel - Farbenführer (color tables), 31. edition. good condition. 1980-1994 Monograph of Czechosl. stamps, set postmark, contains parts 13., 14, 15., 16 I, 16 II, 17 I and 17 II. Total 7 vol., all good condition in/at original covers. 1968-86 Monograph of Czechosl. stamps 1., 2., 4. part., book/-s good condition, covers in margins torn. 1986 Monograph of Czechosl. stamps 4th volume, as new. 1968-86 Monograph of Czechosl. stamps, selection of 1., 2., 3., 4., 13., 14., 16. I + II, 17. I + II. part. Total 10 books, good condition, torn covers. 1940 Monograph stamps with overprint Slovak Rep. 1939, Hugo Kaufmann. Without damage. 1963 Forgeries Czechosl. postal stamps 1918 - 1939, engineer. Karásek, older issue, good condition incl. cover. 1971 Memorial postmark 1919 - 1969, Wenceslas Nebeský, bounded 5 books. Without damage. 2003 Pofis catalogue Czech republic 1993 - 2003, as new. 2005 Pofis Specialized catalogue Czech republic 1993 - 2004, just new! 2005 Pofis Specialized catalogue Czechoslovakia 1918 - 1939, just new! 2005 Pofis Specialized catalogue Czechoslovakia 1945 - 1992, just new! 1901 Postwertzeichen (stamps) Catalogue Ganzsachen (stationery), Gebrüder Senfs, Leipzig. Catalogue p.stat of whole world, very good condition! 1970 Special manual for collector Czechosl. stamps, Ladislav Novotný. Without cover, good condition. 1935 Spezial-Katalog der Feld- and Etappen Poststempel von Österreich-Ungarn aus day Weltkriege 1914-1918, Viktor Majetič. Complete listing postmarks incl. listing ship and submarines. 1949 Thirty y of Czechosl. Stamp 1918 - 1948, issue II., E. Hirsch. good condition.